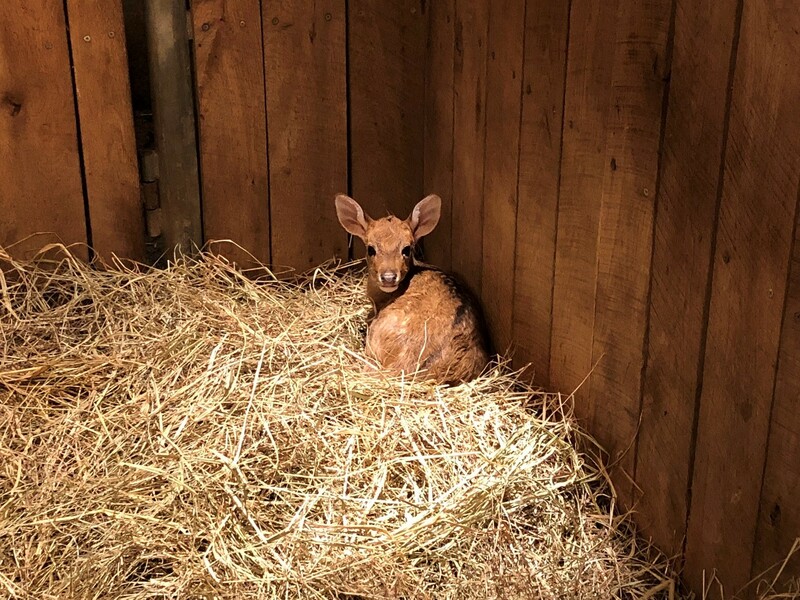 The Smithsonian Conservation Biology Institute in Front Royal, Virginia, welcomed a new fawn to its herd of endangered Eld’s deer Oct. 26. The fawn is doing well and her mother, Ampika, is very attentive and has been nursing and caring for the fawn since her birth. Female Eld’s deer usually live in small groups, or in pairs with their fawns, and are more commonly found in larger herds during the breeding season. The fawn weighed in at 11 pounds (5 kilograms) at her first veterinary neonate exam when she was 24 hours old. She gained 2 pounds within one week, which is normal and a good indicator that she is continuing to do well. Ampika and the fawn will remain separated from the larger herd of female Eld’s deer for six months. Until then, she will be gradually introduced to larger spaces within the barn and yards for Eld’s deer. The fawn and Ampika will be able to spend time with a group of geriatric females in several weeks and will start venturing outside with them when the fawn is 2 months old. SCBI is home to 12 male and 18 female Eld’s deer. Scientists are studying their reproduction and creating a self-sustaining population in human care with the help of animal keepers. SCBI is one of four institutions in North America accredited by the Association of Zoos and Aquariums that breed the species. In the wild, the approximately 1,500 animals remaining are hunted for their hides and impressive antlers, and their grassland habitat in Southeast Asia is severely fragmented. As a result, they are at a risk of inbreeding and losing genetic diversity—making a healthy population in human care important for the species’ survival.